GM has unveiled the U.S. version of the 2011 Chevrolet Cruze that will go on sale in the third quarter of 2010. 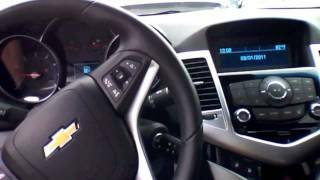 The 2011 Chevrolet Cruze will be powered by a new family of 4-cylinder engine that includes a 1.4-liter turbo and a 1.8-liter. 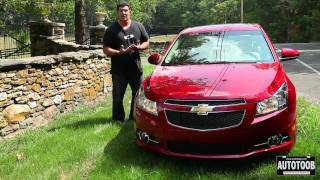 The 1.4L engine is said to offer the 2011 Chevrolet Cruze a fuel economy of up to 40 mpg on the highway. This engine outputs 138 hp and 148 lb.-ft. of torque (200 Nm). The larger 1.8-liter engine of the 2011 Chevrolet Cruze develops less than the 1.4 with 136 hp and 167 Nm of torque. 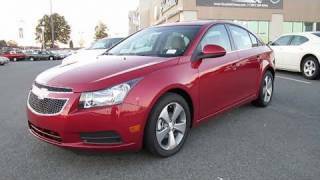 The gearbox choices offered by the 2011 Chevrolet Cruze include two 6-speed transmissions, manual and automatic. The 2011 Chevrolet Cruze is fitted with a MacPherson strut front suspension and Watts Z-link rear suspension and will offer a choice between a range of 16-, 17- and 18-inch wheels. 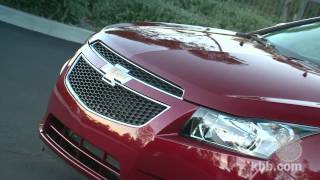 Chevrolet unveils the U.S. production version of the 2011 Cruze compact sedan at the L.A. Auto Show on Dec. 2. It is a global car refined for America, delivering many segment-leading features and details that challenge preconceived notions about what a compact car can be in North America. The Cruze also affirms Chevrolet’s commitment to building refined, fuel-efficient vehicles, with new, small-displacement four-cylinder engines. It is expected to deliver segment-leading fuel economy with a new Ecotec 1.4L I-4 turbo with variable valve timing – including up to 40 mpg on the highway with a high-efficiency model. Leveraging Chevrolet’s design and engineering talent in Asia, Europe and North America, the Cruze brings to market a progressive, globally influenced design complemented by exceptional levels of quietness, quality and attention to detail – from precise tolerances between body panels to the use of premium materials throughout the interior. Cruze goes on sale in the U.S. in the third quarter of 2010 but has already logged more than 4 million miles in quality and durability testing worldwide, making it one of the most real world-tested GM products prior to a U.S. launch. The U.S. and Canadian versions of the Cruze will be built in Lordstown, Ohio, where $350 million was invested for their production. All models share an interior characterized by premium materials and a lengthy roster of unexpected equipment, including leading infotainment. A stereo system that includes MP3 playback capability, six speakers and an auxiliary jack for personal playback devices is standard. A premium Pioneer sound system is available, as is a USB port for iPod operation. Other available technologies include Bluetooth and a navigation system. Chevy Cruze’s design is distinguished with a bold face – including a two-tier grille with the iconic Bowtie logo – that is Chevrolet’s signature look around the globe. An arching roofline connects a steeply raked windshield and fast-sloping rear pillars to give the car a sporty, coupe-like proportion. The sporty aesthetic is also seen in prominent headlamp housings that wrap around the corners and sweep upward in the fenders and sculpted hood, as well as a short rear deck typically found on sports coupes. The wheels are at the corners, too, with minimal front and rear overhangs. 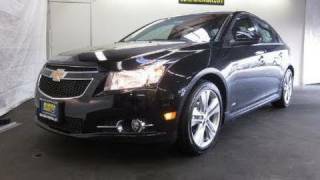 All the elements work cohesively to give Cruze an aggressive look that is complemented by a wide, confident stance. Indeed, the Cruze is wider and longer than most of its competitors. Taut, tightly drawn bodywork conveys solidity, while restrained use of exterior trim enhances the car’s high-quality feel. The overall appearance is one of purposeful precision. Precision is also seen in the Cruze’s build quality. The Lordstown assembly plant’s body shop was retooled with the latest in body-framing and welding equipment to optimize the manufacture of a very solid body structure. That strong structure fosters minimal production variance and repeatable gap tolerances of 3 mm or less between most exterior panels. To the customer, this means a better looking car when new and one that feels solid for years to come. Cruze’s bold design cues and attention to detail carry over to the interior, where a Corvette-inspired twin-cockpit motif is matched with high-quality materials and exceptional assembly tolerances. Grained, soft-touch components and low-gloss trim panels exude a quality that is uncommon in the segment. The instrument panel is an excellent example of how Cruze eschews expectations of compact cars. It features richly detailed instruments that are backlit with light-emitting diode (LED) technology. The LED lights provide a crisp, ice-blue illumination of the analog instruments, as well as lighting for other interior controls. A segment-rare standard driver information center offers a wealth of data for the vehicle owner. Blending harmoniously with the instrument panels is an integrated center stack that houses the infotainment display, climate controls and radio controls. Flush-mounted components within the center stack have a gap tolerance of less than 1 mm, while the instrument panel-to-door panel gaps are less than 5 mm. Those tolerances are among the best in the class and contribute significantly to the Cruze’s aura of refinement and precision. Cruze’s headliner and pillar trim exude craftsmanship, too. The headliner cover is made of a knit material that also serves as one of five layers of an acoustically designed headliner to help make the passenger compartment quieter. The interior pillar and other moldings are color- and grain-matched to the headliner, while seat inserts are color-matched to the color of the instrument panel accent trim, giving the cabin the detailed appearance of larger, upscale sedans. Enhanced with its exhaust-driven turbocharger, the Cruze’s Ecotec 1.4L turbo performs like a larger engine when needed, but retains the efficiency of a small-displacement four-cylinder in most driving conditions. It is standard on LT and LTZ models, with power ratings estimated at 138 horsepower (103 kW) and 148 lb.-ft. of torque (200 Nm). Standard on LS models is an Ecotec 1.8L four-cylinder that has the same basic architecture as the 1.4L turbo. Both engines are part of GM’s family of global small-displacement engines designed with fuel efficiency in mind, including technology such as full variable valve timing that optimizes performance and fuel economy across the rpm band. Backing the Cruze’s new four-cylinder engines are six-speed manual and automatic transmissions. Each contributes to Cruze’s excellent fuel economy and, with their carefully matched gears, enhances its fun-to-drive quotient. With the Ecotec 1.4L turbo, Cruze’s fuel efficiency enables a cruising range of more than 500 miles (800 km), meaning it can go longer between fill-ups. Cruze is backed by GM’s five-year/100,000-mile powertrain warranty – the best coverage in America. Complementing Cruze’s new powertrains is a strong body structure and chassis system designed to deliver a responsive and fun driving experience. The body structure is tight and stiff; and its solidity enabled engineers to more precisely tune the chassis for comfort and driving control. A MacPherson strut suspension is used up front, while a technically advanced Watts Z-link design is used with the rear suspension. It helps center the rear axle during cornering, helping to keep the Cruze’s handling responses symmetrical on both left-hand and right-hand turns. The linkage’s capability to center the axle during cornering delivers a more balanced driving experience, as the rear suspension better follows the lead of the front suspension. StabiliTrak electronic stability control with rollover mitigation, as well as traction control and anti-lock brakes are standard. Electric power steering is also standard on all models. It helps save fuel because it removes the conventional power steering pump from the engine’s driven accessories. Sixteen-inch wheels are standard on LS and LT models, with 17-inch alloy wheels standard on LTZ. Eighteen-inch alloy wheels are available on 2LT and LTZ models. The doors have triple seals and feature fiberglass “blankets” that serve as water, airflow and noise barriers. The doors are also beta-braced, meaning they close with a solid, precise sound and no resonance.